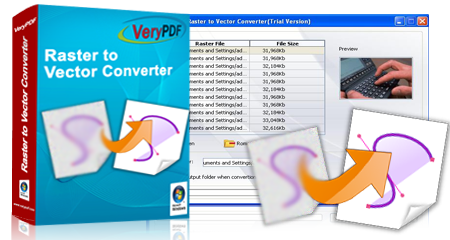 VeryPDF Raster to Vector Converter is used to convert raster files to vector files. With various types of input and output formats, the users can realize many kinds of conversion from raster to vector. 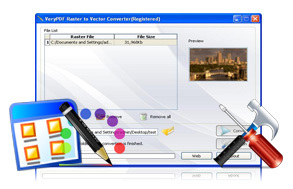 Raster to Vector Converter is able to use advanced algorithms to calculate the paths of raster patterns and convert raster patterns to vector ones. Additionally, the application supports to set page size, resolution, page margin, line color, fillcolor, etc. parameters for target file. With this application, you can fulfill different kinds of functions. 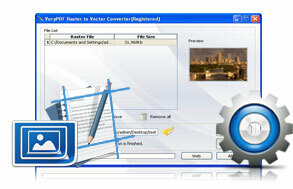 VeryPDF Raster to Vector Converter is developed for converting raster images to vector files. Vector image will be always clear and sharp in magnified view. After being converted to a vector image, a raster image will get a higher image resolution and display definition in a larger scale view. 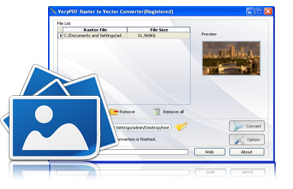 VeryPDF Raster to Vector Converter supports most popular formats of raster images as source formats and common formats of vector images as target formats. It supports input formats of BMP, GIF, JPG, PCX, PDF, PNG, PBM, PGM, PPM and TGA, and output formats of PDF, EPS, PS, SVG, DXF and EMF. VeryPDF Raster to Vector Converter supports different line colors and fill colors for converted vector images. The page size of created vector images can also be set to various types. VeryPDF Raster to Vector Converter supports to set page margin from left, top, right and bottom through manually inputting values. It also allows users to choose the resolution when output file format is image. Additionally, rotation function is available for those who need it. 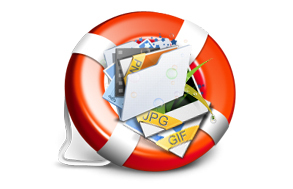 Input formats: BMP, GIF, JPG, PCX, PDF, PNG, PBM, PGM, PPM, and TGA. Output formats: PDF, EPS, Postscript, PS, SVG, DXF and EMF. Support various types of paper size. Allow to rotate the converted vector images. Able to set image width and height. Able to customize the page margin. Option to set the line color and the fill color. Conversion is independent of any other application.